6. Customer Lifetime Value (CLV): The total value of purchases over a customer’s lifetime (or average length of time they actively buy from the company). This is the honker of them all, when you identify the Customer Lifetime Value it is like finding buried treasure. Once you know how much customers buy and for how long, it puts the acquisition cost into a whole new perspective. Spending $100 for new customers makes sense if the CLV is $2,000, but if the CLV is $125, eventually it is not going to work out well. For more step-by-step instructions read “How to prevent your CAC from destroying your business” by Neil Patel. 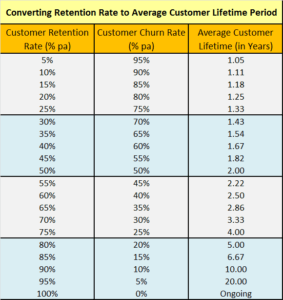 Use the chart to find the lifetime or number of years a customer stays active by converting customer churn rate to Customer Lifetime in years. Divide 100% by churn rate = Lifetime in years.